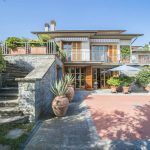 Its commanding position in the landscape is rural but not isolated as it within easy reach of the most beautiful towns and villages in Tuscany, such as San Gimignano (29km), Florence (33km) and Siena (49km). 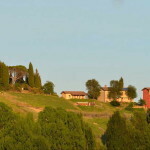 Surrounded by the rolling Chianti hills, the Tyrrhenian Coast and its beaches are approx. one hour and forty minutes away. Golf courses and tennis courts are a few km from the property. The nearest airports are Amerigo Vespucci airport in Florence (42 km), Galileo Galilei airport in Pisa (93 km) and Guglielmo Marconi airport in Bologna (130 km). This expansive property consists of three buildings: the manor house, the wine cellar and the farm shed. The manor house has a surface area of approx. 460 square meters, it is laid out on two levels plus the attic floor and it is made up of five apartments. The 1st apartment is laid out on the first floor and it includes living room, kitchen, two bedrooms, two bathrooms and hallway. The 2nd apartment is on the first floor and is made up of kitchen/living room, two bedrooms, two bathrooms and hallway. The 3rd apartment is laid out on two levels and comprises kitchen/living room, three bedrooms, bathroom and hallway on the first floor, attic floor on the second floor. The 4th apartment is laid out on three levels, composed as follows. Ground floor: dining/living room, two living rooms, kitchen, study, bedroom, bathrooms and hallways. Small independent building with boiler room and half bath. First floor: three bedrooms, three bathrooms and walk-in closet. The 5th apartment is laid out on the ground floor and includes kitchen, living room, bedroom, bathroom, loggia and oven. In total, the manor house has eleven bedrooms, ten bathrooms and five kitchens. The wine cellar (565 sqm) is laid out on two levels plus the attic floor, composed as follows. Lower ground floor: three cellar rooms. First floor: cellar room/vat cellar, storage room, olive oil mill and barrel room, office, changing rooms, half bath and loggia. The farm shed has a surface area of 120 square meters and is made up of two rooms and a utility room. This quality property dates back to the 16th century and it was built using local stone. The manor house features terracotta flooring, stone fireplaces, red brick arches, bright and cosy rooms. The buildings were renewed in the 18th century and they have recently been restored and improved from an environmental and energy point of view, for example, solar panels were installed and rainwater tanks were built. The property has an external parking area and a beautiful swimming pool (16×6 m) with comfortable entry/exit steps and panoramic views. 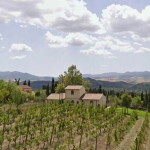 The manor house is surrounded by about 78 ha of land, of which 15.11 ha are vineyards and 6.66 ha are olive grove. Grape varieties: Sangiovese, Merlot, Cabernet-Franc, Cabernet-Sauvignon and Petit Verdot. 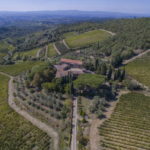 The property, set between Florence and Siena, is the ideal solution for those who are looking to invest in the prestigious Chianti Classico wine-growing area. 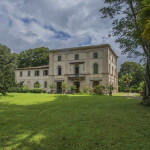 Two apartments are currently being used as tourist accommodation but the property does have the potential for various residential/commercial activiies.